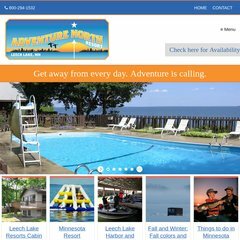 Topics: Lake Cabins, Fishing/hunting, Amenities, Winter Activities, Photos/rates, and Amenities. Age: The domain is 19 years and 8 months old. fishingleechlake.com Fishing Leech Lake and Walker Minnesota for musky, walleye, bass, ..
Its 2 nameservers are ns31.domaincontrol.com, and ns32.domaincontrol.com. It is hosted by Godaddy.com Inc (Arizona, Scottsdale,) using Apache web server. Its IP Number is 208.109.138.74. PING (208.109.138.74) 56(84) bytes of data. A ping to the server is timed at 63.4 ms.